Bill is actually chuckling here in this photo. 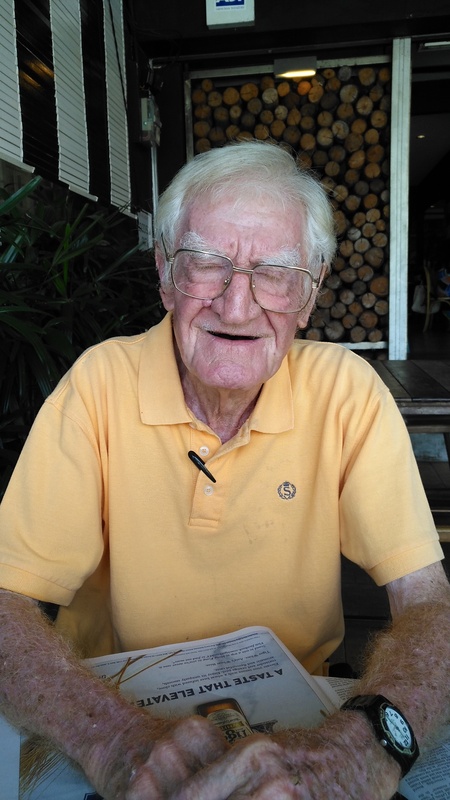 William Brownlie Hilston (Bill) has been a resident of Malaysia since the 80’s, actually he arrived here, when it was Malaya in the 50’s but moved around Asia for work. Scotland was his home. You’ll see Bill rock up to Hillside Café on Tuesdays and Wednesdays, and you’ll find him settling into his favorite corner at Gusto’s the rest of the week. Bill always has a smile, sometimes he’ll forget to bring his teeth, like today, but he’ll always have a smile and a story for you. 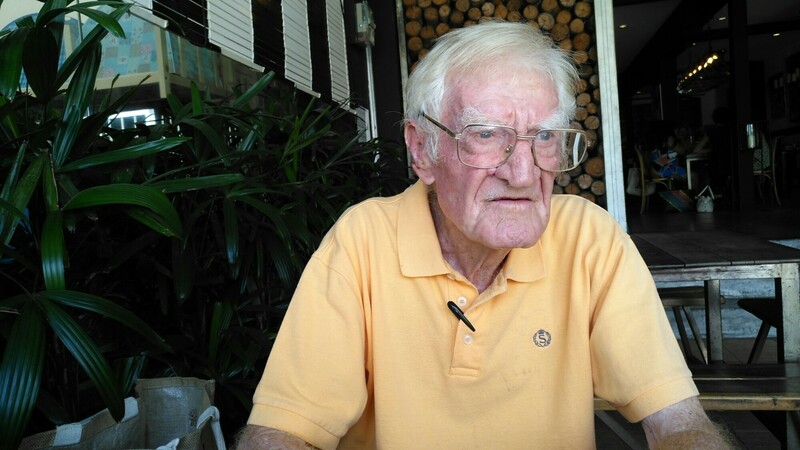 Bill worked all over Asia, he spent time in Indonesia, Thailand, Cambodia, India, Malaysia, his last stint was working on an estate as a General Manager and Planting Advisor, he proudly planted the first oil palms in Cambodia, then retired from Cambodia at 80. He told me a story today, I had to pay extra attention to his gentle tone of story telling, plus he forgot his teeth today. I wondered how old he actually was, I had so many questions, but resisted bombarding him with them. So he took me back to a page his life. “ While in Cambodia I was called by my colleague to be ready at 4 o’clock in the afternoon, for an outing. ‘You can’t wear shorts Bill’, so he took me home and I showered and put on long pants , a little curious and a little apprehensive I asked him, “where are we going at 4.30 in the afternoon?” My colleague kept to his vagueness and we drove on. “Are we going for a dinner and is it a 2 hour journey?” Still he wouldn’t tell me. Finally we reached to an opening of field and we were met by a very large group of people, I estimated about 5,000 people on that field. I realised it was a rally of some sort. They placed me at the main table on stage with other, presumably, politicians, and heads of states. I understood nothing for 2 and half hours as it was all in Khmer and couldn’t help nodding off to sleep. Feeling a sharp nudge suddenly, I looked up and saw that I was invited to the podium. I was worried that I had to do a speech in front of 5,000 people. The speaker was my boss, also a senate at the time. He beckoned me over warmly, and rested his outstretched arm around my shoulders. I stood by him while he continued speaking to the massive audience. I had picked up a few phrases in Khmer, but only knew a few , just to get by. I knew he was talking about agriculture, its industry, and some positive words referring to productivity. The crowd listened intently and all this while he kept patting me on the shoulder as he spoke. As he closes his speech, with the last line, which I didn’t fully understand, crowd suddenly erupted and roared with laughter and we heard the thunderous clap of 5,000 people. I was then ushered back to my seat, bewildered. What could he be saying? I leaned over and asked my colleague sitting next to me. I thought I’d share today’s adventure, because Penang is quirky that way. Here is another shot of Bill, see you soon for more stories Bill! Previous Post Restaurant Review : indigo at The Blue Mansion, Penang, Malaysia. Next Post The Elephant’s Nest , a shop house turned vacation home in George Town, Penang island.